How to Practice the Buddhadharma with the subtitle: A Lamp Illuminating the Path to Liberation by Sera Je Lharam Geshe Tsulga is a practical explanation of how to put the Buddha’s teachings into practice, with emphasis on the early stages of the path, guru devotion and the importance of dharma in light of reincarnation. The book gives excellent and throughout instructions for meditations. 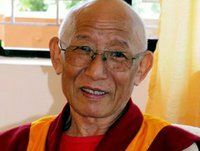 Geshe Tsulga fled Tibet in 1959 after the Tibetan uprising against Chinese occupation. He arrived in the USA in 1995 and is now a teacher at Kurukulla Center in Boston.